Can China Woo India to the Maritime Silk Road? Aware of New Delhi’s mistrust, Beijing is trying to link its MSR to India’s own Project Mausam. Last September, as Chinese President Xi Jinping promoted the Maritime Silk Road (MSR) during a tour of Indian Ocean states, Indian Prime Minister Narendra Modi prepared to launch India’s own plan for maritime integration: Project Mausam. That initiative envisions India as the center of the “Indian Ocean world,” which stretches from Africa in the west to Southeast Asia in the east. Like China’s Maritime Silk Road, Project Mausam would boost regional commercial and cultural linkages – but where the MSR would have all roads leading back to China, Project Mausam seeks to return India to its role as the center of Indian Ocean trade. On the surface, the two projects do have much in common – both seek to expand regional integration, especially when it comes to trade and commerce. But on a deeper level, both the MSR and Project Mausam are about expanding influence – culturally, economically, and even strategically. India devised Project Mausam to counter perceptions that China was becoming the major Indian Ocean power; the chances of New Delhi allowing its initiative to become a sidespur to the larger MSR are slim to none. China has had success in other cases tying its MSR to another country’s own development goals, most notably Indonesia’s “maritime fulcrum” policy. But when it comes to India, China faces deeper issues of mistrust and strategic competition. India has yet to buy in to the MSR, holding out even during Xi’s visit to India last year. Despite China’s repeated insistence that the MSR is a multilateral project (a “chorus” rather than a Chinese “solo,” in Xi’s words), India isn’t buying it. To get India on board the MSR, Beijing will have to make real progress at dissolving the strategic issues between the two countries. Notably, China seems to be trying to do just that. China and India have raised hopes that they are newly committed to solving their long-standing border dispute – an ambitious goal that, if realized, could change the strategic calculus between the two neighbors. Both countries will be pushing for progress before Modi’s planned visit to China this May. 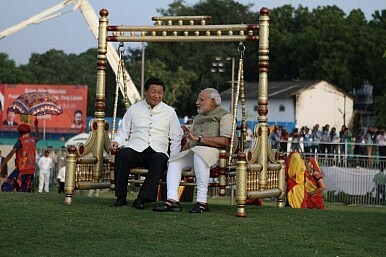 By next month, then, we should have a better idea if China’s MSR can ever woo India. China and India hope to complete the next step in settling their border dispute in time for Modi’s May visit to China.